Sugar egg puffs and Typhoon Style daikon cakes at Peony. 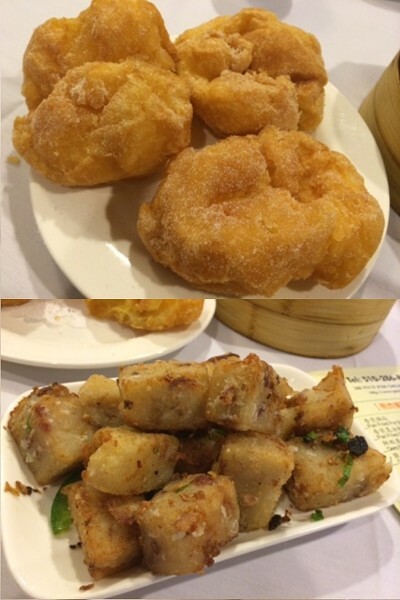 Back home, I knew all of the best dim sum spots, but since I have moved to Oakland I feel totally lost. I'm looking for a real deal experience, with the carts and chicken feet and all. Can you throw me some recommendations? For years, I shied away from getting weekend dim sum in Oakland Chinatown, mostly because it never seemed worth it to have to deal with the long lines and the despairing search for street parking. Instead, more often than not, I’d get my siu mai and steamed rice roll fix at Alameda’s East Ocean (713 Webster St.), whose workmanlike dim sum is consistently very good, if not extraordinary, and where the dining room is spacious enough that the wait is never as long as I fear. Or else I’d schlep all the way up to El Cerrito for L & L Chinese Seafood (10140 San Pablo Ave.), which lacks the helter-skelter fun of the pushcarts, but makes up for it with its laid-back vibe, friendly staff, and handy picture menu. But a recent visit to Peony (388 9th St., Ste. 288), on the second floor of the Pacific Renaissance Plaza, right in the heart of Chinatown, made me reconsider my future dim sum noshing plans. Fresh off a recent remodel, the restaurant is clean, brightly lit, and big enough to accommodate a crowd. At around 10:30 on a Saturday morning there wasn’t any wait at all. More importantly, the actual dim sum — served off of carts as requested, though there’s also a checklist menu that’s useful for ordering harder-to-spot items — was as good as any I can recall eating in the East Bay. The shrimp inside the har gow (steamed shrimp dumplings) were admirably plump and not the slightest bit overcooked; the rice rolls were soft and fresh-tasting. As an added bonus, Peony serves a number of dishes I haven’t seen elsewhere in Oakland: “Typhoon Style” daikon radish cakes (fried cubes that were dotted with crispy garlic bits), for instance, and airy, sugar-dusted egg puffs — one of my favorite dim sum sweets. All of these restaurants should serve a decent plate of chicken feet. I'll leave it to you to report back on which one is best. One last tip: Any armchair dim sum expert can tell you that the very best Bay Area dim sum spots are located on the Peninsula, and they’re not wrong. But if you want to get a taste that style of higher-end dim sum a little bit closer to home, and in a slightly less frenetic environment, Dublin’s Koi Palace (4288 Dublin Blvd.) — the sister restaurant to the more well-known Daly City location — is also very good.